Bringing sweet treats to Monthly Leadership Meeting in the beginning of each month has become the latest style. Yes, the sweet savoury food made by me, for the meeting! I made this Mango Cake for the meeting early this April. 1st attempt, and all the peers were my ‘guinea pig’ (laughing)! I felt glad and was very pleased with my 1st attempted Mango Cake! Most of all, it was greatly appreciated by the colleagues. Yeah! Each of them got only a small slice of it as I was capable making only a 8″ sized square cake, at the moment (smile). A small slice of my mango cake counts about 220kcal. By adding of milk and water into it, the texture of my cake was not dense, but very soft mouthfeel. A bite of it together with the cream and real fresh mango cubes, creates extensively refreshing relish, with a hint of vanilla flavour which yielded from my homemade whipped cream. With the presence of generous amount of real mango flesh, chill the cake and eat it cold creates even better mouthfeel and more refreshing. Mango on top and in the middle layer of the cake! It was instead, the cake mango (laughing)! In my recipe, I have added with this ingredient named Ovalette. This was my first time getting to know about this substance called, ovalette. My colleague recommended it to me, to be added into sponge cake baking. I, later, found out that it was actually the sponge cake gel, to act as stabliser. It supposed to help to make the sponge cake smoother textured, raise better and evenly. Ovalette has yellow and white in colour. The one I got from my colleague was yellow. It is a non-scented thick paste. Need not to use a lot, just add as little as half a teaspoon into the cake mixture will do. It is available in certain baking supply specialist stores, such as, Phoon Huat, the distributor of Singapore Red Man Brand. It has many branches around the Island. If you have problem finding baking stuff, go there. They should be able to help you. As for now, let’s bake my cake! 1) Mix cake premix flour, butter, milk mixture, and eggs into large mixing bowl. Use electrical mixer to beat cake mixture well at medium speed (No. 2), for 8 – 10 minutes. 2) Pre-heat oven for 10 minutes, set temperature to 180°C. 3) Grease and line a sheet of grease-proof paper evenly on a 8” square or round baking pan. Pour in cake mixture. 4) Place baking pan at centre rack. Bake for 30 – 35 min using 180°C (top and bottom heat on), or until toothpick inserted in the centre comes out completely clean. 5) Allow cake to cool on wire rack, for about an hour. 6) When cake is completely cooled, slice it into 2 layers, using bread knife. 7) For filling: Use half the amount of whipped cream with half the amount of diced mangoes you have prepared, and combine it well. Spread a thick layer of filling evenly on the bottom layer of cake. Leave some space around the edge of the cake. 8) Top another layer of cake. Spread another half amount of whipped cream just on top or covering the whole cake. Next, place another half amount of the chunky diced mangoes on top evenly. Chill decorated cake in the refrigerator till ready to serve. Look at the goodness again! By eating just the mango flavoured cake itself tastes very flavoursome, too. Not as greasy as marble or butter cake, this mango cake gives a fresh zesty relish in the palate. Yes, before it was topped and filled with creamy mangoes. The fragrance of mango flavour from the freshly baked hot cake was over-whelmed, even before adding the creamy topping and real mango flesh as its filling. I decorated the cake with topping of whipped cream and lots of diced mangoes. The real stuff! Give it a try. It’s simple and quick to learn! Tips: Chill the decorated cake in the refrigerator, for even better and more refreshing taste. *Do not over-fill the centre layer of the cake to avoid spillage from the edge when placing with another layer of cake on top. Next, you mentioned 50ml mixture of milk+water…should i do 25ml of milk + 25ml of water? As for the ready-to-use instant whipped cream, can I get it from NTUC? Is it the one that comes in a bottle can?? Good choice for your hubby’ birthday cake.. It’s easy.. Ya, you may use all milk, all water or 50:50 ratio of total 50ml. Hmm… Yes. You can use the bottle can type which may find it at NTUC, for easier job, but I thought it might be a little costly to use those instant whipped cream for creaming whole cake, I think.. Unless you dun mind the cost to save some job here, if not, if you can’t find any fresh cream or cream for whipping at NTUC, you may consider making a trip to specific baking supply shop to get the non dairy fresh cream like I used to whip it by your own, for guaranteed taste and result in this case :)? However, dun worry, it’s not necessary must be that specific brand, u can just take my recipe or advice as a reference.. I think I will go with your suggestion and do my own whipping cream. I will buy that Emborg,from NTUC… as its only 200gm, just the right amt for this recipe :) BTW, the the butter amount is only 10gm….so little..enough!?! :p hehee..this is my 1st attempt to do sponge cake. 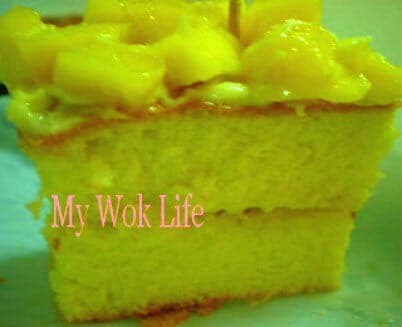 Can I make this mango cake 1 day in advance and put it inside a box to be used the next day? Or should I just bake the sponge cake on Saturday and then make the whipping cream and mango on Sunday? Make whole cake then refrigerate it one day before, or bake the cake and whip the cream first but dun spread on the cake yet, just store separately in fridge. Then, cut the mango and do the filling and creaming only on the actual day.. The cake and cream can be kept up to 4 days. Between, 10 gram of butter is sufficient, u can even dun add it but slightly more egg and water, if you are using the sponge cake premix as stated. Thank you so much for answering all my questions. I will do both the cake and whipped the cream, 1 day in advance :) I went to NTUC today and bought the brand, President, for the whipping cream ;) Hope all goes well (fingers crossed)…. I will keep you posted on the outcome next week :) Thank you once again! hey there, ur mango cake looks delicious. and i was shocked at the little amt of butter used too. i would like to ask whats the minimum hours is needed to chill the cake in the fridge? what the estimated time for preparation? if i want to make smaller size of the cake, isit alright to just ratio all ur ingredients into smaller portion? Thank you for your recipe and advice! Thanks for liking my cake. Yes, it was delicious and easy to make. I did not use alot of butter as this was made with sponge cake premix. Hmm.. It was pretty fast to complete the whole baking process, to me. Plus baking time of abt 30 – 50 min, it took ard 1.5 hr. There isn’t any restriction on chilling time as long as you find it cool enough to serve. I chilled mine for 1 hr or sometimes overnight before I serve. And yes, you may just ratio the amount accordingly, for smaller or bigger cake. Happy to know that you had the mango cake done well. Hope your lubby like it, and had great birthday. Thanks for sharing the recipe with us going to try and bake this for my gal bday tomorrow. Just pray that the cake will turn out well. How long must I whip the whipping cream if I intend to cover the whole cake with cream how much whip cream is require? You mentioned that we may use all milk can we use UHT milk? Use amount about the size of a drinking cup should be more than sufficient. Whip it for abt 8 – 10 min, or until foamy and fluffy consistency. Yes, you may use UHT milk. hi pat, will the mangoes turn black after a while? do we need to lace it with lemon / lime juice? It’s me again, try out the cake but if I baked using 200g of flour it didn’t rise much for cutting the cake into half so I double up the ingredients. I used the white colour sponge cake gel. The base of my cake is hard hope you can advise why? I used my kitchen aid mixer to mix at medium speed – 4 for about 10 mins. After baking about 35 mins my cake not done yet it was still a bit wet in the centre. Hoep to hear from you soon. From what I have seen on my cakes, the mango did not turn ‘black’ from oxidation even after a few days. I wouldn’t use lemon juice (unless just to rinse with lemon water may be OK) as it might taste sour on the mangoes, but I will glaze a layer of peach or apricot gel solution on top to ‘protect’ it as well as creating a glossy looking surface for better presentation. No need to double up the flour as 200 gram should be sufficient to rise till able to half it. Yours was not rise and hardenat the base, should be due to insufficient beating. You should beat the flour solution till it is really fluffy. I mean reeeallyyyy fluffy, foamy looking texture. Follow the exact amount of all ingredients except you may reduce addtion of milk to just 30ml, that should not be any issue to yield the same texture of the cake. As for fluffiness, try increase the beating time at high speed till achieving the desire fluffy consistency. Otherwise, your cake won’t rise and resulted uneven texture when baked. I want to make this cake for my boyfriend’s upcoming birthday, but seems hard! haha is it easy? It’s easy to make cake with cake mix. I am not sure where to get the ingredients in Toronto, but I think it will be surely easy to get baking stuff in western coutries than in Asia. Try baking supplies section in supermakets, look for sponge cake mix, instant cake mix, ready cake mix flour, or similar naming, regardless the brand name. Saw your recipe, thought it looks EZ, hence hunt down the cake mix you proposed. Your recipe call for 200g of the cake mix (with sugar and baking soda & all included). I beat the egg white and yolk seperately and it yield very small amount of batter. The finished product only produced one-and-a-half inch of sponge. I added Overlett, the texture is not as soft as it looks in your picture, it was hard. So I thought may be I have to bake another portion of it to be the top of the sponge layer. This time, I followed your instructions, mix all flour, eggs, milk, butter at one go but the result is worse, it only yield 3/4 inch of cake, texture is so hard that it can even spin it without distroying it. Can you enlighten me where have I gone wrong? Beat all ingredients ad per my steps, till very light, creamy and fluffy. Butter be at room temperature, too, before beating. Most importantly, the batter had to be really fluffy creamy light consistency. Thanks for your prompt reply, Pat. I will give it another try. I had 2 failed experiences of whipping cream (I bot emborg 200ml cream), first time, the whole mixture turned into curd with cream and water seperated. I discarded it. 2nd time, it was creamy but not foamy enough, hence it appeared not enough cream to cream middle and top of cake. 3rd time, I cream for a very long time, slightly better but not foamy or attractive enough. It was messy too, it splattered all-over my walls and counter top despite using only speed one to cream. Any advise for a less fussy and messy way of whipping cream? So sorry to hear that.. Actually, I personally find it harder to whip the cream successfully with Embro brand, too. I would prefer Red Man brand’s Non-dairy whip cream. It would be almost 100% success rate everytime I whip cream with Red Man’s. Got it from Phoon Huat. I tried making today but it became kueh like. I am not too sure what went wrong in the process. I did not put ovalette though. And it was not baked evenly, became out of shape :(. Can advise? Beat the ingredients longer till really fluffy and you may have added slightly more water/ milk. So, reduce your addition. Also, may extend the baking time to longer. I’m a random student, looking for Mango Cake. Hmm. Is it possible to use raising flour for the mango recipe? ‘Cos Im cooking for the exam practicial. However, 10g of butter seems a little. Please advise me more so. I hope to pass my cook exam. Hehe. Bake King gotta be available at the supermarket such as NTUC,cold storage and Carrefour, huh? 2) The amount of butter in this recie is good enough. No worries about the measurement if you follow exactly here. 3) Bake king is available in many super markets. I usually get this sponge cake mix in NTUC Extra Hypermarket. 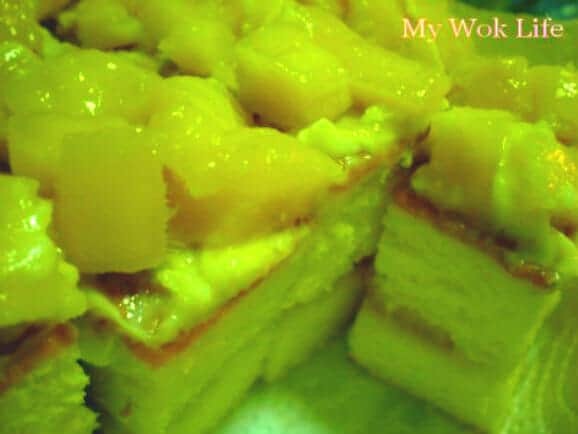 Do this mango cake is simple and will be alright for a cooking exam. I am from Spore as well. Thanks for posting the mango cake recipe. It sure looks easy and I am definitely going to try it very soon! Keep up the good work and keep on posting of more recipes. So far so good for my bakes. I am just afraid the top half will not be cooked if you do not turn on the top heat. Put your baking tray in the middle rack while baking shd be ok. I tried to use your recipe yesterday, the cake is only 3cm tall. I mix the ingredients together and beat for 10 mins. The batter is still creamy and not fluffy or foamy at all. If I replace the optima flour does it help? It shouldn’t go wrong if you follow exactly. Use Optima flour is perfect, but if you would like to replace it with other type of flour, try self raising flour and remember to add 200gram of sugar, too. If use plain flour, add also 1/2 teaspoon of baking powder. I beat the egg yolk with the rest of the ingredients into a batter. Then I beat the egg white separately. After the whites are in soft peak, I fold them slowly into the batter. It is not so heavy…..my earlier trial is too heavy, like eating cheesecake:) Well its up to individual preference!